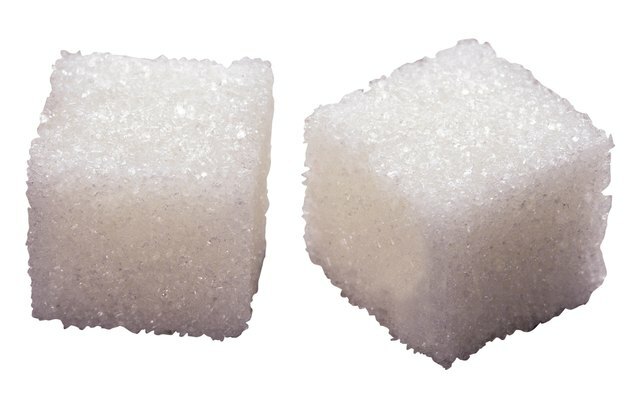 Sugar, a form of carbohydrates, is quickly available to be converted to energy. If sugar calories are not used as energy shortly after they are consumed, however, they are converted into stored body fat by a process known as lipogenesis. One form of sugar in particular, fructose, may be more dangerous and likely to be stored as body fat than other types of sugar, such as sucrose, or table sugar. According to the National Council on Strength and Fitness, the two most common sources of carbohydrates in the American diet are high-fructose corn syrup and sucrose. These refined sugars, which are added to many foods, lack the vitamins, minerals, proteins and fiber found in complex carbohydrates. These "empty calories" can cause blood sugar levels to spike, which in turn causes insulin levels to rise. Insulin is a hormone released by the body that helps regulate blood sugar levels. If sugar is not quickly used for energy, insulin removes it from the blood, and it is then converted into triglycerides in the liver. These triglycerides can then be stored as body fat. Scott Olson, a naturopathic doctor, notes that there is a lot of confusion about whether to reduce fats or sugar from the diet in order to lose weight. According to Olson, there are good fats and bad fats but "there is really no good sugar that you can eat." This is because sugar quickly turns to fat inside the body. Olsen says this is because the body prefers not to waste energy. Therefore, when you consume high amounts of sugar in a single sitting, the body's solution is to store it for later. Low-sugar diets can be effective for managing weight and health. According to nutritionist Dr. Jonny Bowden, fructose is converted to fat more quickly than any other type of sugar. Fructose is the sugar found in fruit, often extracted and processed into the ubiquitous high-fructose corn syrup. Fruit, however, contains relatively low levels of fructose when compared to foods with processed sugar. In addition, fruit are whole foods that have fiber and nutrients. Therefore, fruit does not need to be eliminated from the diet, although those who have problems with weight gain or insulin resistance may want to limit their fruit consumption. University of California, San Francisco, obesity expert Robert Lustig contends that sugar is a poison that has a high propensity to be stored as body fat. Lustig contends that not all types of calories act the same way once inside the body. Fructose is not metabolized in the same way as other foods and is much more likely to be stored as fat in the liver. The doctor notes that in respect to health, sugar is worse than fat and can have the same artery-clogging effects. Lustig also says that eating fruit is OK because it also contains fiber, which partially blocks a portion of its carbohydrates from being absorbed. Of all sugars, processed forms of fructose, such as high-fructose corn syrup, are the worst, according to Lustig. Olson ND: Which is Worse, Fat or Sugar? How Does Sugar Affect Energy Levels?